Florida and Arizona top the list of preferred warm weather destinations for retired Canadian travellers. Now that we are smack dab in the middle of winter, if you are retired (or of retirement age) and like to travel, you may be setting your sights on where you can go to escape the snow, slush and cold. 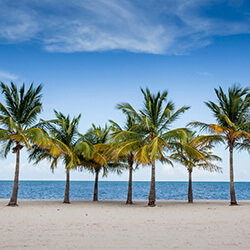 While travellers in Ontario, Quebec and the Atlantic provinces overwhelmingly picked Florida as their number one destination, Canadians in the western provinces preferred Arizona's dry heat. Arizona came in as the top pick among 21.5 per cent of travellers from western Canada, followed closely by California (20 per cent) and Hawaii (20 per cent). Since you will likely be gone for a month or more, check your driver's licence, licence plate sticker, health card and passport to make sure they do not expire while you are away, and renew if necessary. Check the expiry dates on your credit cards too, as well as your auto insurance and home insurance policies. Call your home insurer and ask if there are special arrangements you need to make to keep your policy in force that require planning now. For example, you may have to arrange for a family member or trusted neighbour to do a walk though of your home on a regular basis. Install automatic timers on the lights throughout your house. Program the timers so that the lights go on and off in different rooms at different times to give the appearance of movement in the house. Burglars are less likely to target your house if it looks like someone is home. Start shopping around now for a snow removal service that will ensure your driveway, walkway, and sidewalk are clear of snow and ice. Home insurance claims for slips and falls may only be covered if you've taken the necessary precautions to avoid potential injury. If driving to your destination, reach out to your auto insurer as some insurance companies have rules about how long a vehicle can be outside of the country. Each insurance company is different, but a call to your auto insurer will ensure your coverage is maintained. You'll also want to review your policy's liability limit with them to confirm the coverage is sufficient; the CSA suggests increasing your limit to $2 million or more when driving out of the country, as claims, especially in the U.S., can be costly. Buy travel insurance before you leave. Travel insurance is a necessity because it will cover the costs of emergency care in the event of an unexpected illness or injury, when your government health plan may not: "Your Canadian insurance is almost certainly not valid outside Canada," says the Government of Canada. "Your provincial or territorial health plan may cover nothing or only a very small portion of the costs if you get sick or are injured while abroad." Plan your travels with confidence, knowing you'll be covered financially should you fall ill while away. Travel insurance premiums for snowbirds can differ wildly from one provider to the next by hundreds of dollars. In fact, we've found that snowbirds can save an average of 53 per cent just by shopping around. Compare snowbird travel insurance policies today for the coverage you need at the best possible price, no matter where you go.